The 1950’s and 60’s had been very good for the company and baseball in general. Mickey Mantle, Jackie Robinson, Ted Williams and others made the previous decade a wonderful time to be a fan of the game and a maker of sports cards. 1970 Topps Baseball marks the first Topps set since 1952 to not have a Mickey Mantle card in the set. That fact alone makes this a good choice for someone looking to complete an entire vintage Topps Baseball set on a smaller budget. The cards released toward the end of the series (High Numbers) are more rare and can be harder to locate. However, even in 1970 Collectors were aware of the over saturation of card production and the big business it had become for Topps. Below is an excerpt from a newspaper article published in 1970. “Topps, asserts Sy Burger, the company’s sports director and trading card expert, puts out some 250-million cards a year. The cards begin to hit the market in March and continue through the baseball season. Up until about 1957, most of the annual sets numbered only around 200 (cards). For the past 12 years, though, the sets have come in series of seven per year, totalling over 600 individual picture cards each season. Some cards feature multiple players so the above figure is just an estimate. Just based on the photography fee – 1.8 Million 10 Cent Packs would have to be sold to cover that cost. (Topps obviously sold the packs to retailers for less…so the figure is actually quite higher) You can imagine the printing, packaging, shipping and other general business costs that Topps takes on during manufacturing…meaning this was a huge business even back in 1970. In fact, if you take the $180,000 figure above and convert it using the US Government Inflation Calculator, that buying power is equivalent to $995,274.74 2009 US Dollars! Bubble Gum was truly Big Business for Little Kids in 1970. Carl “Yaz” Yastrzemski was one of the best all-around baseball players of the decade. Known as much for his defense as his bat. A multiple Gold Golve award winner and a member of Baseball’s 3,000 Hit Club. Carl Yastrzemski was elected to Baseball’s Hall of Fame in 1989 and is still one of the most popular Boston Red Sox players in the teams history. Vida Blue played 15 Season for 3 different teams: A’s, Giants (twice) & the Royals. Vida Blue went to 6 All-Star Games and won 3 World Series rings during his playing day. The highlight of his individual career would be his 1971 AL Cy Young Award. Since his playing days, you can find Vida Blue working for charities and he signs many autographs at card shows around the US. His career is overlooked by other great pitchers during his era, most notably Nolan Ryan. Gene Tenace is not a name you think of often when you think of October Baseball. However, during Gene Tenace’s 14 year career he won 4 World Series Titles. In 1972 Gene Tenace won the World Series MVP award while playing for the Oakland A’s. Tenace actually has 6 World Series rings as he won 2 as a hitting coach for the Toronto Blue Jays in the early 90’s. In 2001 Topps decided to leave Gene Tenace off this Vida Blue Autograph. It may be due to the lack of interest in Gene Tenace Autographs or the fact that he had only 1 Autograph we saw on eBay: 2004 UD Legends Gene Tenace Autograph #A624. When you look back, these are two great players that collectors have overlooked somewhat over the years. With the lack of notable rookie cards in the 1970 Topps Baseball set, this card stands out as a great buy. In 1970 Topps was really making sure you knew who hit home runs in 1969. They did a great job at getting all the stats together considering this was before the internet made it easy to locate statistics. Taking a look at the stats on the back of the card Harmon Killebrew, Frank Howard and Reggie Jackson had HR numbers that would stand up in today’s game. This was a small error that was discovered by Topps and corrected. The original checklist has card #226 Ron Perranoskilisted as R Perranoski instead of R. Perranoski. The original ERR card is #128A and the correceted version is #128B. Before Reggie Jackson was know as “Mr October” in New York, he was a star on the west coast in Oakland playing for the Athletics. 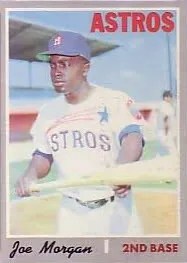 However 1970 wasn’t Reggie Jackson’s best season … hitting just 23 Home Runs and batting only .237. In fact the A’s sent Reggie Jackson to play in Puerto Rico where he bounced back to help the A’s win 3 World Series Titles in the 1970’s. NR-MT Copies of this card (PSA 8 – BGS 8) sell in the hundred dollar price range, where cards in worse condition can be had for less than $10 – $15 in most cases. i have a 1970 topps don pavletick number 504 that was double stamp, i was looking for the price and if it was listed as a error card.